The spring-driven movement of this chronometer is constructed between two circular plates. 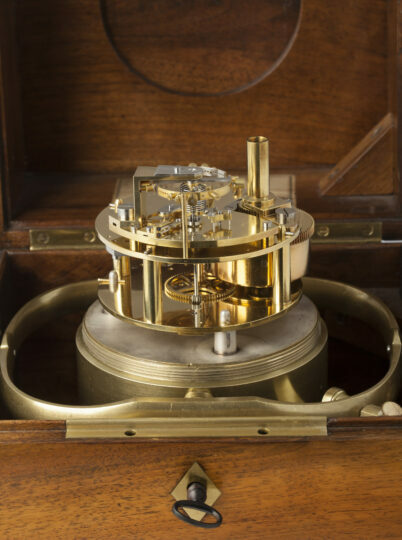 It has a single barrel and Earnshaw spring-detent escapement on a separate platform, with bimetallic compensation balance and helical spring, cylindrical balance weights and adjustment screws, all housed in a brass gimballed bowl. The 10.5-cm silvered dial is signed and numbered Breguet, Neveu & Comp.ie No 345. It has a Roman hour chapter ring above and outer Arabic ten-minute divisions, the time being indicated by a pair of golden spade hand. Below is a seconds dial with Arabic ten-seconds divisions and a delicate blued-steel hand. 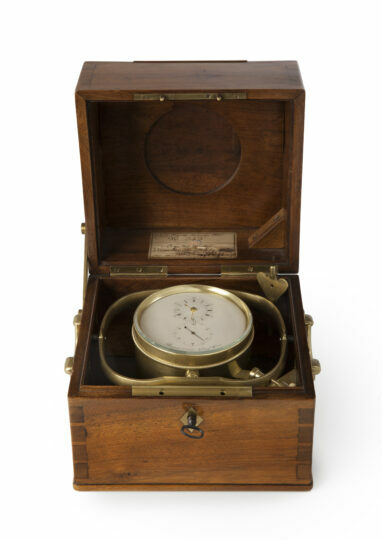 The two-tier walnut case of this chronometer has two external brass drop handles attached to the sides and a sliding top, inset with a diamond-shaped brass plaque which is engraved No 345. When slid out, an observation port is revealed which allows the time being read without opening the top of the case. The front has a lock with a diamond-shaped brass escutcheon. The brass numbered Breguet winding key is situated in the top right corner. Note: The clock was sold by Huette, Breguet’s agent in Nantes, on 28. 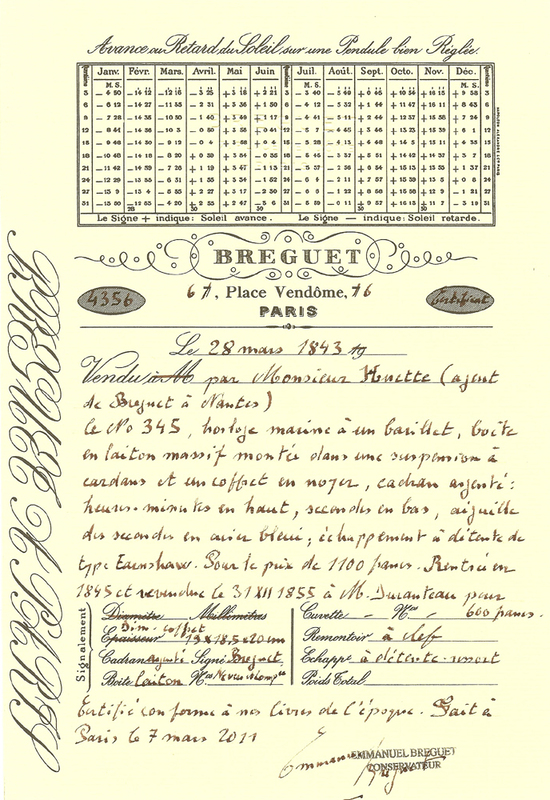 March 1843, as is testified by the official Breguet certificate. Dimensions: 19 cm. x 18.5 x 20 cm. – George Daniels, The Art of Breguet, London 1974. – H.M. Vehmeyer, Clocks. Their origin and development 1320-1880, Volume II, Gent 2004, pp. 955-959. Abraham-Louis Breguet (1747-1823), born in Neuchâtel, Switzerland, was about fifteen years old when his stepfather sent him to Versailles to be apprenticed to the watch trade. He attended evening classes at the Collège Mazarin and learned mathematics, probably finishing his studies around 1767. He emigrated to Paris a year later, together with his mother, stepfather and sisters. In 1775 he married Marie-Louise L’Huillier. They opened their business on Quai d’Horloge 51 soon after, now number 79, located in the centre of the watchmakers’ district near Pont-Neuf. It took five years of hard work for Breguet to establish his reputation. 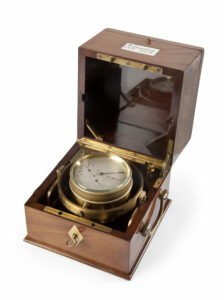 There are no records of watches manufactured before 1787, but it is evident that Breguet was interested in perfecting the mechanics of the self-winding watch, and realized that his future lay in using his special talent for ingenious and complex new horological designs, destined for the royal houses of Europe. The Duc d’Orléans in 1780 and Marie Antoinette in 1782 came into the possession of self-winding watches, or perpétuelles as Breguet described them, and this is proof of his early success. He developed these perpétuelles in the following years and in 1786 began to manufacture them in larger numbers. 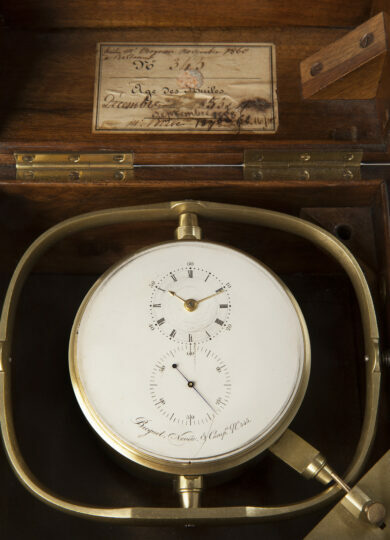 We can see from the company’s records that the manufacture of a perpétuelle was very expensive and in 1787 he secured a partnership with Xavier Gide, an established dealer in clocks and watches, as a means of acquiring additional capital for the business. This was not a lasting success, however, as the two men probably did not get on due to their opposing characters and unfortunately their partnership was dissolved in 1791. Gide was a fiery revolutionary, whereas Breguet aspired to aristocracy and moved in noble and court circles. 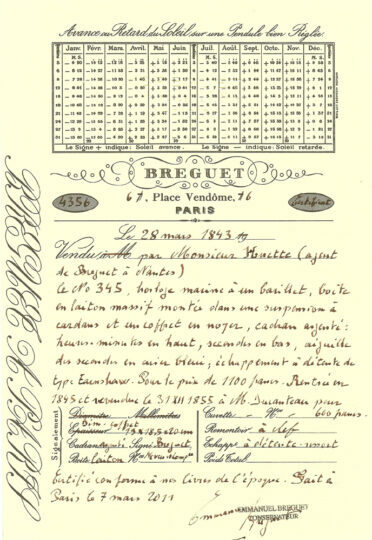 The French revolution disrupted Breguet’s life in Paris and in 1793 he left with his son and sister-in-law and travelled to Genève, Neuchatel, and finally to Le Locle, but they returned to Paris on 20 April 1795 and re-established their company at the same address: Quai d’Horloge. He must have felt at home there as he was extremely productive, and many of his important inventions and most exceptional creations were produced during this period. Breguet had already invented an important winding-key in 1789 (later named after him) and continued with the montre perpétuelle (1795), the Tourbillon regulator (1795), the pendule sympathique (1795) and the montres à tact (1796-1800). In 1807 Breguet took his son Antoine-Louis, who studied watchmaking under John Arnold in England, into full partnership. The last ten years of Breguet’s business life were extremely successful and most of the crowned heads of the world could be counted as his clients. He must have been a happy man and was lucky to receive every possible honour during his lifetime. Already made Horloger de la Marine by Louis XVIII, he was also made Chevalier de la Légion d’Honneur, a member of the French Board of Longitude, and in 1816 was elected to the Académie Royale des Sciences. This creative watchmaker died rather suddenly on 3 September 1823 in Paris.